P. S. stands for postscript, which comes from the Latin word postscriptum and literally means “written after.” It’s used for an afterthought, not cool enough to be a part of the main piece. Like, oh by the way, I forgot to mention this but blah blah blah. It gets a bad rap, but as Shaun Usher of the Wall Street Journal wrote, “The P. S. is the most charming part of a letter. It’s the wink you give as you walk away.” It’s the cherry on top, the bam for the wham, and the mic drop. Like, P. S. – You the shiznitz. What? What?! 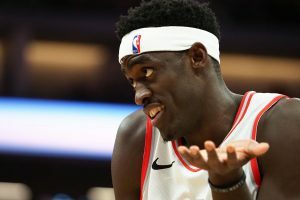 Which segues perfectly to Pascal Siakam. A career-high in points scored. On the season, Siakam has been a top 40 player, but over the past four games, he’s been top 25. 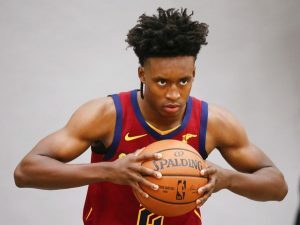 The usage rate has spiked to 28 and he’s averaged 35.3 minutes, 26 points, 1.5 tres, 9 boards, 3 dimes, 1.3 steals, and 1 block while shooting 50% from the field and 81% from the line on 8 attempts! He literally does it all. Like literally, as he can play center or be a point forward. The improvement in his game has been nothing short of amazing. P. S. is no longer an afterthought and has to be a no-brainer for Most Improved Player. I live in Los Angeles and enjoy skiing and snowboarding. I also like long walks on the beach while strumming tunes on my ukulele. Although there are ski resorts less than two hours drive away, it doesn’t rain often here. Los Angeles averages around 12.8 inches of rain per year. Last year, LA received 4 inches of rain. Only Las Vegas, Phoenix, and San Diego average less. For perspective, New Orleans averages 62.7 inches, while many of the big cities in the U. S. are in the 40-50 range. If it doesn’t rain often, then it doesn’t snow often, which means the slopes are no bueno, even with the artificial snow makers. Now, recently it’s been raining so much that I’ve been Googling ark blueprints. All that rain has been like frozen manna for the local resorts. A picturesque perfection of powder. Which describes the situation for JaVale McGee. McGee has started the last two games because Ivica Zubac was traded to the Clippers. 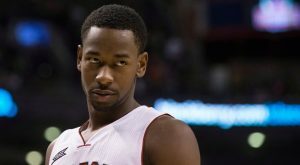 He’s played 26 and 30 minutes, and averaged 19 points, 10.5 boards, 1 block, and 0.5 steals. 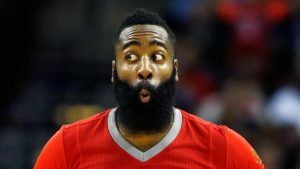 Per 36, he’s averaging 18.3 points, 11.2 boards, 1 steal, and 3.4 blocks! He’s probably not going to get 36 minutes of run per night, but with only Tyson Chandler, Moritz Wagner, and Mike Muscala the only threats to playing time, McGee should get close to 30 minutes per night. The conditions are pristine at McGee Mountain. Enjoy your stay. 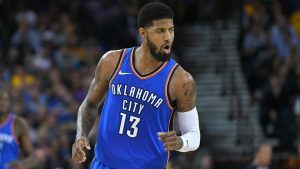 Fantasy Basketball: Buy/Sell – You Get a Trade, Everyone Gets a Trade! The NBA trade deadline is upon us! There are already some deals that have been finalized and more are sure to be done by tomorrow, so this week’s article will be structured in a different format than usual. Instead of looking at Buy/Sell players individually, we will review each trade for fantasy winners and losers, in chronological order. But first, as per usual, let’s take a quick look at last week’s suggestions. Patrick Beverley has been a steady contributor for the short-handed Clippers and only stands to benefit without Tobias Harris (more on this trade later). Another trade influenced Trey Burke’s value but unfortunately, he takes a huge hit in Dallas and is an easy cut candidate. Shabazz Napier and Jerryd Bayless had good performances this past week and will continue to produce until their respective teams get healthier. Finally, I still maintain that D’Angelo Russell is a prime sell candidate and his shooting this past week only reinforced this belief. A brook is a small stream that invokes a sense of calm and serenity. I see a man painting the beautiful landscape on the canvas held up by an easle. The green grass on the banks reflect off the water while Bruce Lee whispers into my ear, “Be like water.” The birds chirp while the frogs croak. I just want to sit down, cross my legs, and meditate. Ohhhhmmmm. SLAM! BLAM! KAPOW! POP! BOOM! A Westbrook, on the other hand, is….well, imagine a herd of wildebeest crossing the Mara River…..with a bask of crocodiles that haven’t eaten in weeks. That’s Russell Westbrook on the basketball court….and last night he feasted. Westbrook has now messed around in back-to-back games and last night marked the fifth time this month. Over the last four games, he’s averaging a trip-dub with 1 threeecola and 1 steal. With that said, he’s only been a top 80 player because of the lack of blocks, 68% shooting from the line, and 4 turnovers per game. Beep. Boop. Bop. 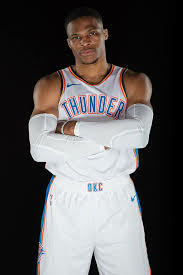 I was wondering why the Stocktonator was watching so much Animal Planet yesterday, as it had Westbrook as it’s #1 player last night. Fantasy Basketball: Boogie is Back! All eyes were on Boogie last night, as he finally made his return from an Achilles injury and did not disappoint. He looked a little rusty, but overall gave reason for all Warriors fans to smile. He displayed the ability to hit three-pointers, as he was frequently left wide open, and made the Clippers pay. 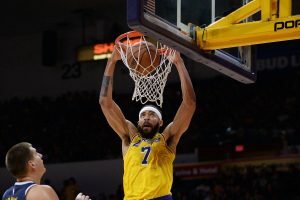 On the downside, he somehow managed to foul out in just 15 minutes, which is impressive in it’s own right and an obvious Boogie move. Cousins showed up and quickly made his presence felt in this one. He’ll be up and down for a while, as he gets in shape and manages his return from injury. Still, this was very promising for Boogie and his fantasy GMs and a scary prospect for the other 29 NBA teams. He scored 57 the prior night! I’ll never forget 2003 Kobe when he went nine straight games scoring at least 40 points. That was sick. This is…..illmatic. Shout out to Nas.